Having a dairy allergy is probably one of the worst allergies ever. I never realized how much stuff had dairy in it, until I could no longer have it. Now, what is dairy in? Chocolate. What can every ovulating woman not avoid around that special time of the month? CHOCOLATE. To be fair, there are vegan versions of chocolate chips available to buy, if you are a millionaire…which I’m not. So, I scoured the internet looking for a recipe to make some homemade chocolate chips. While I found several recipes to try out, they were all epic failures. The coconut oil and maple syrup (or honey) were not miscible, at all, no matter what the temperature was. Two distinct layers were formed, the maple syrup on the bottom, and the coconut oil on top. SO, I decided to put my scientific degree to work to come up with a recipe that A) works and is foolproof and B) is pipeable without have to wait for it to get to a specific temperature (Wilton candy melts, I’m looking at you…). The result is a very creamy chocolate. It took an insane amount of willpower to not just eat the entire bowl. I hope you enjoy these! 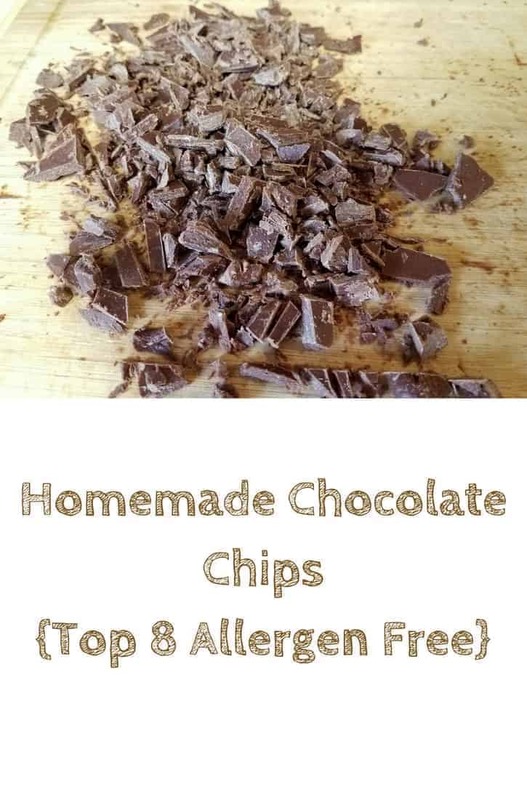 These homemade chocolate chips are free from the top 8 allergens, making them a great choice for those with food allergies. 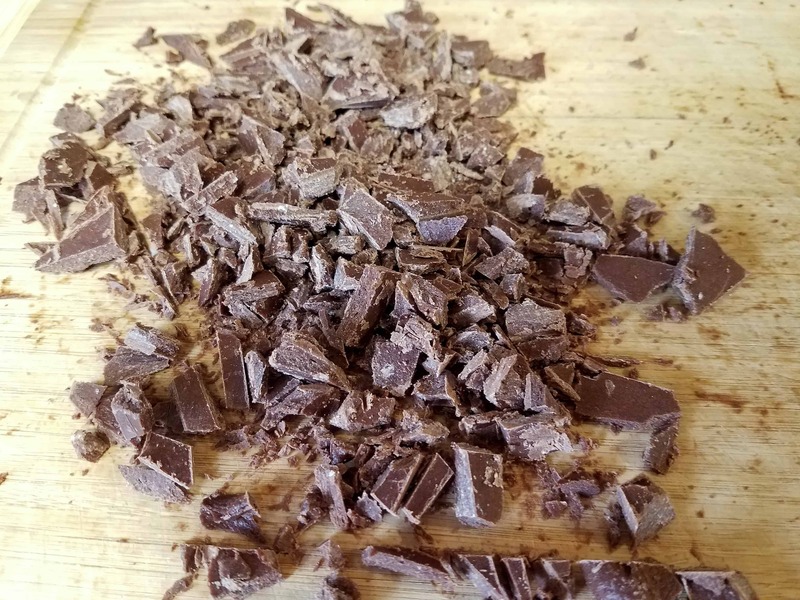 You can use this recipe to either make chips for baking, or to make chocolate candy bars. Starting with a clean bowl, place 1 cup of solid coconut oil in it. With an immersion blender, whip the coconut oil so that it is smooth and creamy. It should reach the consistency of lotion. Pour in the maple syrup, and mix into the whipped coconut oil with a spoon. Pour in the vanilla extract, and again, mix with a spoon. You might find that the coconut oil wants to slide all over the bowl. I found it easier to incorporate the vanilla if I mixed quickly. Pour in the cocoa powder, starting with a 1/2 cup. Mix with a spoon until incorporated. Then taste test. If it’s chocolatey enough, then mix it one more time with the immersion blender to get rid of any lumps. If it’s not chocolatey enough, add in more cocoa powder, a 1/4 cup at a time (I wouldn’t exceed a cup). Once the desired chocolate level is reached, mix one more time with the immersion blender to get rid of any lumps. The consistency should resemble a chocolate frosting almost. Place a piece of parchment paper on a baking sheet that you know will fit into your freezer. You can either spread the mixture out into a thin layer or pipe it into the shape of a chocolate chip onto the parchment lined baking sheet. Place baking sheet in freezer. Let freeze for 2-3 hours, or until chocolate is hard. Remove chocolate brick from the freezer, and first break it into chunks with your hands. Then using a chef’s knife, cut it up into smaller pieces. Store chocolate chips in the freezer, and use them just like store bought chocolate chips. I can’t wait to try this recipe! I limit my dairy intake (I probably shouldn’t have it at all) because it causes fatigue issues for me. I love that these are made from ingredients I already have. Thank you! No problem! ? 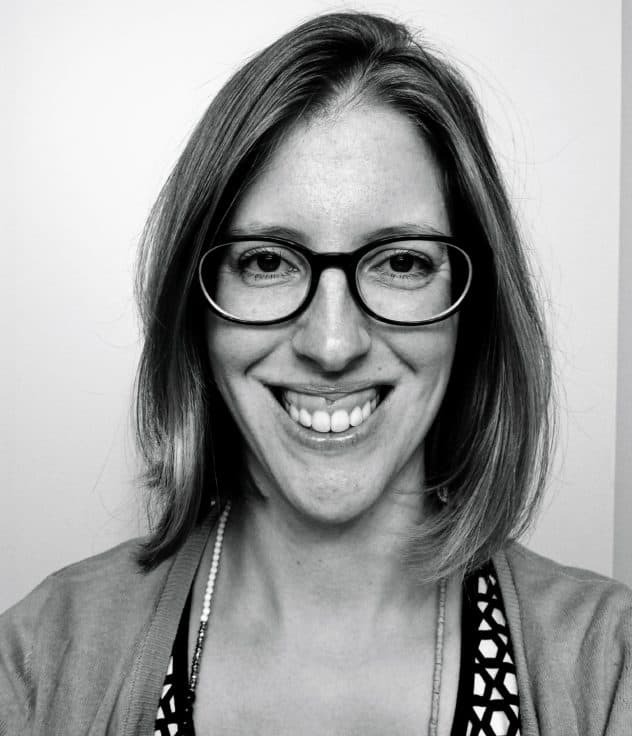 Going dairy free is very hard, but hopefully my blog will make it a little easier for people to navigate. I’ve been partially dairy-free (could still eat yogurt, butter, and hard cheeses) for a while, but recently had to go full out dairy-free because of a suspected allergy (still waiting for the test results). I am veggie but my mum is vegan and I had never thought of this! This is such a great idea! I cant wait to try this ahha honestly so excited. I never knew it was so easy to make chocolate! Will definitely try this recipe when my store of chocolate chips runs out! Thank you for the recipe! I’m not a cook, and I never thought about making your own chocolate chips. You do an excellent job of laying out the steps and making it easy to follow. Ooh is there anything better than chocolate? I love the idea of making my own like this and the recipe seems quick and simple to follow! This will probably sound ridiculous but I have never thought of the chocolate making process. What a great recipe! I never knew you could make your own choc chips before!! I am so definitely trying this out during the week. my husband will love this! I love chocolate and i’m crazy for it . If I can make some at home its just more than perfect for me. Thanks for sharing the recipe I would try it for sure . Thank you for this! I am not allergic to dairy, but sometimes it can make me sick. I actually try an avoid things with dairy in it, so this is a great alternative. Definitely, need to give this a try, I really enjoy indulging in chocolate from time to time.